A moment of carelessness at the building site and a glass pane can fall onto the floor and break into a thousand pieces. It is not just the weight that poses a risk to feet, but also the sharp glass on the floor. When there is a risk from above and below, it is better to be wearing S3 safety footwear. A risk assessment is a central element of operational health & safety. Potential risks, e.g. in kitchens, could amanate from fallings objects, slipping or stress on the joints. These need to be identified and assessed first before selecting the right footwear. 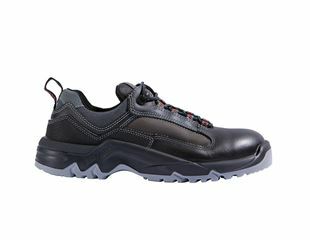 One essential factor is the choice of protection class (type of shoe or safety shoes). 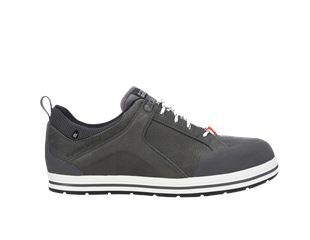 Whilst the footwear by engelbert strauss are packed full with safety features, they are not as bulky as you would imagine and include a toe cap. 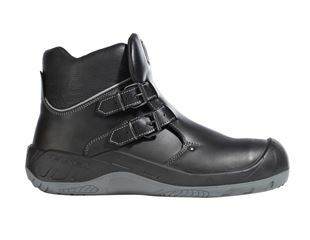 Lots of models, like the seamless S3 Thyone safety boots, have a sporty modern sneaker look. They don’t just look good, they are also extremely comfortable and comparatively light. In addition to the footwear, there are also more classic models in our range of safety footwear available: safety shoes (mid) and safety boots. The high-quality, durable, waterproof and protective leather and textile surfaces protect the feet all round up to the ankle. They are also extremely durable and pleasantly easy-care. 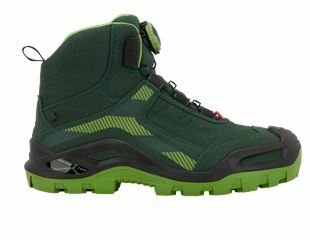 But whether safety footwear is sporty or classic, they are never boring, thanks to the huge range of colours above and beyond the conventional black. 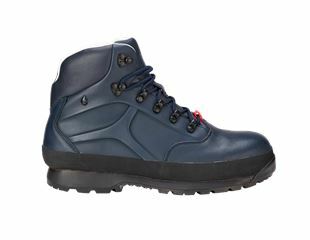 Are you looking for sporty S3 safety boots in ‘Gentian blue’ or boots in ‘Walnut/wheat’? No problem, our footwear guarantees safety! Our S3 boots with toe cap are waterproof and resistant whenever things get intense; and there are risks everywhere on building sites: nails, protruding pylons, falling building materials and heavy equipment. Sturdy boots that comply with the minimum requirements of DIN EN ISO 20345 are just as essential here as a protective helmet because safety always comes first! And because things can get hot, sweat is also an important issue. All our footwear is equipped with a waterproof dryplexx® membrane that protects the shoes from water from the outside, and also makes them very breathable. This keeps the wearer’s feet pleasantly comfortable and absolutely dry. When working on jobs that require protection from electrical charging you should also ensure that your shoes are equipped with ESD. S3 safety footwear is also ideal for use outdoors where the profiled sole comes into its own, be it on gravel, slippery forest floors or icy roads thanks to its optimum grip. This is the right choice for anyone who is looking for work shoes for the winter. The sturdy nature of the S3 footwear means that they are inherently warmer. And when the temperature drops below zero, the S3 shoes help thanks to their additional CI cold insulation, e.g. the Canopus model by engelbert strauss. The mid models and safety boots remain warm for a long time and the temperatures inside the shoes only drop very slowly even at an outdoor temperature of minus 17°C. In contrast, anyone working on hot surfaces up to 150°C needs boots that can cope with these kinds of temperatures. Ensure they have HI thermal insulation. 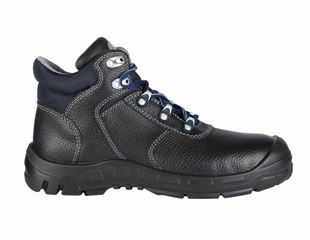 These work shoes can withstand high temperatures for up to 30 minutes without a problem. The more rigid the design of the shoe, the tighter it may be for the toes because the shoes hardly yield. Whilst this can be compensated with more flexible materials in sport shoes, it can quickly lead to problems in safety shoes. e.g. deformations. This is why we supply S3 safety shoes in a 12 cm width for wide feet. The wide fit offers enough space and absolute freedom of movement for the toes. 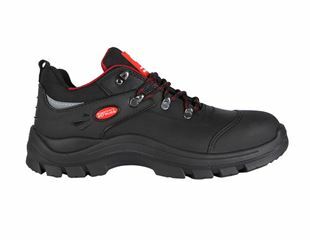 We even supply safety footwear up to size 52 for people with wide and large feet. Depending on the task, season and personal preferences, there are numerous possibilities for women and men with regard to protective equipment in the S3 safety category. Be it casual safety shoes in a sneaker style with a rotary fastener and toe cap, durable safety shoes with antistatic properties in the mid variant in a 12 cm width or thick safety boots for the winter – you will find exactly the right work clothes to meet your needs at engelbert strauss.